Initially, I would record these videos using Keynote on my Mac, edit them on my Mac, and post them online on my Mac. 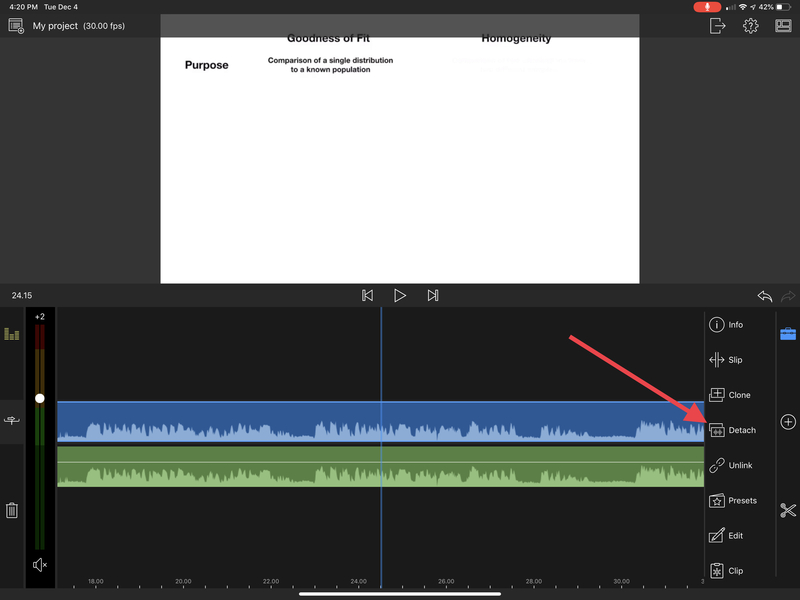 Over the past year or two, I’ve shifted the entire process onto my iPad – recording with an external mic, editing it in its entirety, and uploading it using Safari. I’m documenting that process in this post for my future self and for anyone else that is interested in doing this too. 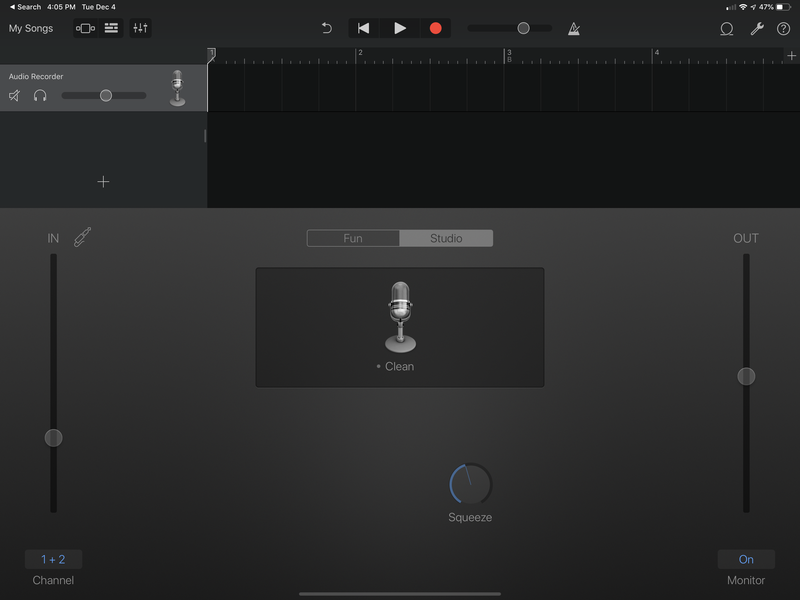 Recording a Keynote presentation has become possible since iOS 11 introduced screen recording to Control Center. Now, I can tap record, go through a Keynote presentation, write on slides as I go1, and end up with a high quality recording of my presentation. One thing to keep in mind is that I always use presentations with a 16:9 (widescreen) aspect ratio. This way the annotation tools don’t show up on the presentation as I go, and when I export the final video in widescreen all the UI is hidden from the viewer (more on that later). iOS’ screen recording feature also allow you to keep the microphone on while recording, so that you can narrate over your slides. However, if you’re in a noisy environment or have a very hot mic (I’m looking at you, Blue Yeti), you might want to add a noise gate and some gain control. Luckily, if you use an app that can send your mic input through your headphones while in the background, iOS screen recording will pick up the processed audio! I use GarageBand for this. It’s free, it’s reliable, and it integrates with third party apps. Here’s what my GarageBand file looks like. It’s a single, flat audio track taking in my mic input and feeding it through the monitor (which is set to on). You’ll notice that I keep the gain level pretty low on the left. Now for the fun part. If you tap the track control buttons on the top left and tap “Plug-ins & EQ”, you can add a noise gate, change the EQ, or utilize any number of third party effects. One app I highly recommend is Brusfri. Once you record a few seconds of silence, you can let Brusfri listen to your recording and filter out background noise for when you record your video. Once your recording is complete, it’s time to edit. Editing video on the iPad has become pretty easy since the introduction of LumaFusion. 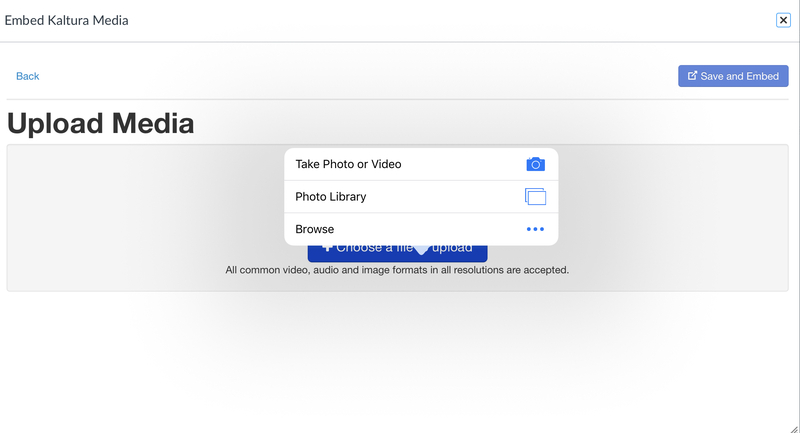 To begin with, LumaFusion allows you to create a video in the 16:9 aspect ratio, which immediately gets rid of all UI elements from my video (if you want to use a simpler solution like iMovie, I suggest Video Crop as an inexpensive app that will impose the aspect ratio that you need). Once your video is in LumaFusion, the world’s your oyster. You can create crossfades, add titles, or do whatever chopping and screwing your heart desires. Second, if you didn’t do any noise reduction/voice boosting before recording, you can share your video to Brusfri or Ferrite to clean up the audio, and then drop the audio file into LumaFusion alongside the video. At this point, 100% of my needs with respect to this workflow are satisfied by my iPad. This means that I have a fully mobile recording studio, and it’s quite easy to make a high quality video in a relatively short amount of time. Hope others will find this useful and, as always, please let me know if you have questions or thoughts. In April of last year, Apple released an update for Pages that supported rendering equations entered using LaTeX or MathML. I was really impressed that Apple chose to support not one but two standards for entering equations1, but was pretty bummed to learn that equation rendering was specific to Pages. Today that changed. 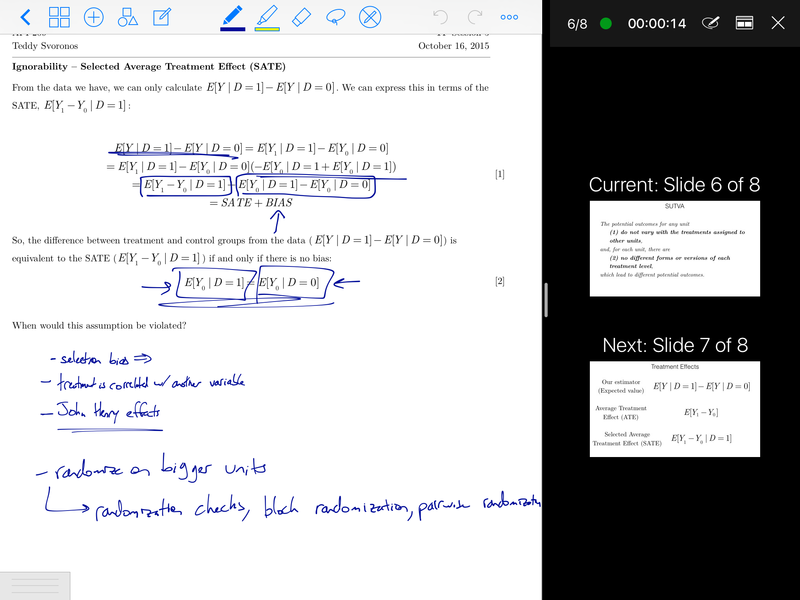 All three iWork apps now support equation rendering (even Numbers!). This is a big, big deal for me; it’ll be a huge timesaver2 and enable for much richer math-based animations in my presentations. If you combine this with handwriting apps like MyScript Nebo, you can hand draw equations, copy them as LaTeX code, and paste them right into your iWork document. On a different note, iWork on iOS is really growing up. 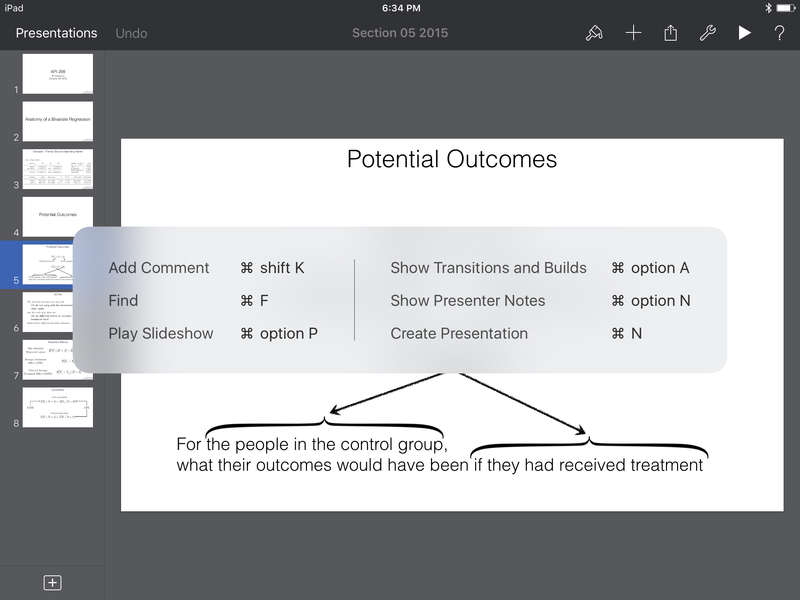 Keynote now supports the editing and creation of paragraph styles and master slide layouts. I still work with Keynote most efficiently on MacOS, especially when editing animations in bulk, but the iOS apps are becoming more and more self-sufficient with each update. I delivered a short presentation on two-stage exams1 at the Harvard Initiative for Teaching and Learning Annual Conference back in September. I’ve talked about these in the past, but this time (a) there’s more of a focus on quantifying collaboration, and (b) there are some neat visuals that I couldn’t show on a podcast. Video below. I’ve talked at length about the technological details of my teaching setup, and I frequently get questions about exactly how it works. This post is an attempt to document my current setup1. The side screens display supplementary content on Keynote slides that reinforces, organizes, enhances, or extends the handout content that we’re working on together. These include section headers, animations, and Poll Everywhere polls. 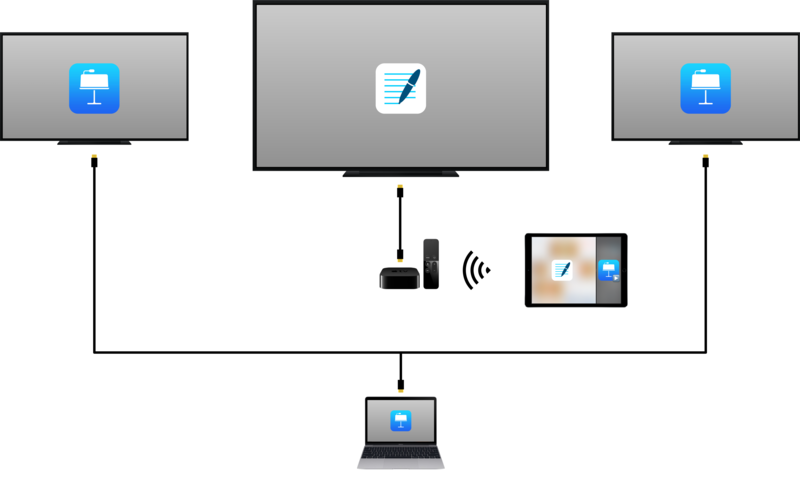 In short, I wirelessly project my iPad to the main screen via an Apple TV, and control my MacBook (which is projecting the side slides) from my iPad using Keynote for iOS’ remote functionality. A MacBook4 which is plugged into the side screens. PollEv Presenter running on my MacBook and Poll Everywhere’s presenter view loaded on Safari on my iPad. I also keep OmniOutliner running on my iPad with notes that I reference throughout the lecture such as answers to practice problems and information on who to call on. Keynote’s remote functionality involves magic from a dark dimension that is a big help while teaching. 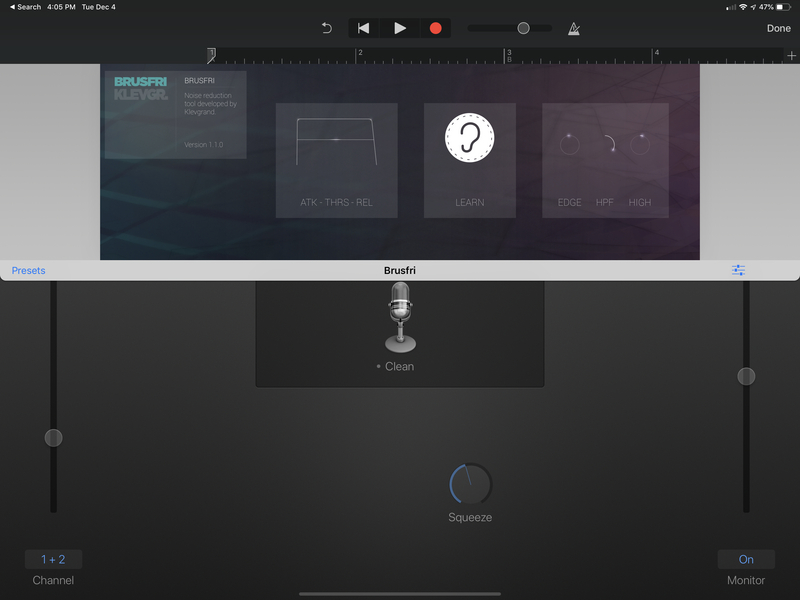 It essentially gives you a presenter view interface on the iPad that can switch to an annotation mode if needed, making it indistinguishable from the experience of running the presentation from the iPad itself. Better still, it connects via peer-to-peer networking, so it doesn’t matter what kind of network you’re connected to. I’ve used this on a university network in the United States, on a captive network in India, and on a shaky network in Nepal, all without problems. Running the Keynote slides from my MacBook allows me to embed polls in Keynote without having to switch apps. Poll Everywhere’s presenter view allows me to view results of polls before I reveal them to the classroom. This means I can choose my next step (which may or may not involve showing the class their responses) based on the distribution of responses. I can also hide/lock/unshare the poll from the presenter view on my iPad, which propagates to the poll displayed on the MacBook. This setup can get more or less complex depending on your needs and resources. If I’m stuck using a one screen setup, I usually choose between GoodNotes (if I have a lot of writing to do) or Keynote (if my class plan has lots of animations in it). 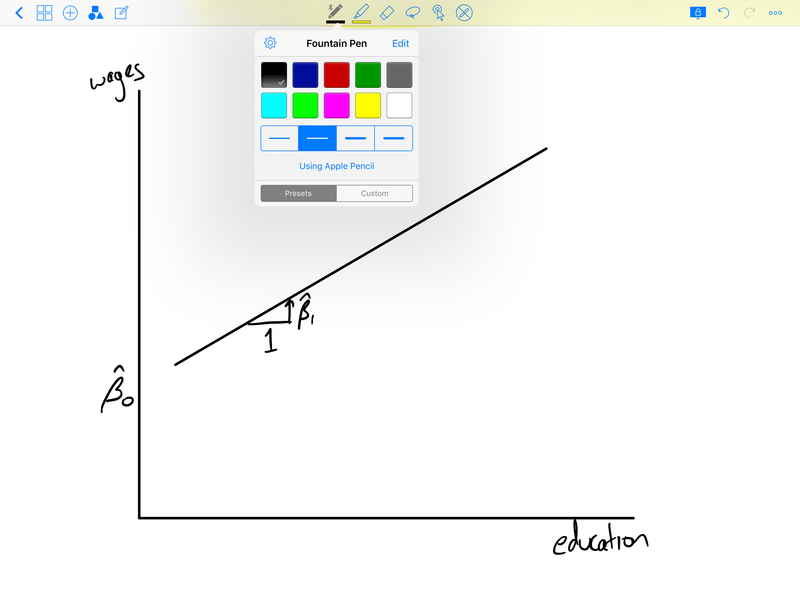 I could (and do) switch between the two apps occasionally (e.g., if I have mostly handwriting to do but have one animation to show later in the class), but it’s not a particularly smooth transition. For polling, I recommend Perfect Browser pointing to your Poll Everywhere polls, since it has a UI-hiding presentation mode as well. I’m currently experimenting with adding another device to this setup in the form of an always-on iPad that only I can see. On this iPad I run my OmniOutliner notes and the Poll Everywhere presenter view in Split View, so that I don’t have to use Slide Over on my main iPad (which can accidentally advance my Keynote slides if I’m not careful). That said, I think I can do more with this additional device; if you have any suggestions, please get in touch. This setup has worked very well for me, but only because I genuinely believe that it improves the learning experience for students. Having supplementary animations and interactive polls has well established benefits, but these materials are often accompanied by increased friction as the instructor switches inputs, activates the poll, and troubleshoots errors in the middle of class. The setup in this article minimizes that friction and, once you get the hang of it, maximizes the time in the classroom spent on learning. That said, my parting advice is to weigh the costs and benefits of complicating your teaching setup before trying out something like this. Hopefully the benefits are clear, but the cost in the form of an increased cognitive load as you teach is nontrivial. Keep your eye on the real goal of improving learning and, if this post helps you get closer to that goal, have fun! My journey through the world of podcasts continues, this time on the Teach Better Podcast (an excellent podcast that you should check out if you have any interest in pedagogy and higher ed). This one has (almost) no technology in it. Instead we discuss a collaborative exam structure called Two Stage Exams, and the pedagogical benefits of adopting it in my courses. Later on we get into more general questions of collaboration and student participation in large classes, a conversation that I’m still thinking about. This summer I was lucky enough to guest on two podcasts. How I combine PDF files to post to my class via Workflow. My second guest appearance was on the Teaching Higher Ed podcast, hosted by Bonni Stachowiak. This one was much more pedagogy-oriented, and focused on presentation techniques that I have found to be useful as a teacher. Hope you enjoy them, and please get in touch if you have feedback. I was recently interviewed on ABLConnect, a Harvard-based “online database of active learning efforts in post-secondary classrooms.” I talk about my use of GoodNotes to take pictures of student work in class, embed them into a GoodNotes document, and annotate them without skipping a beat. It’s a great tool to get students to engage with the material in a collaborative way. Enjoy, and please get in touch if you have any feedback. This week I was on Mac Power Users to talk about my workflows related to teaching and academic research. I’m a huge fan of MPU so it was quite an honor to be on. Have a listen – feedback always welcome. Note: I have no affiliation whatsoever with the developers of GoodNotes, nor do I receive any compensation from them. I just really, really like their app. I do 99% of my teaching with an iPad that’s projected onto a screen, via an Apple TV or wired connection. I often get asked about the different apps that I use and what they do. Luckily, the list is very short: Keynote and GoodNotes. I have written about Keynote a whole lot, but the truth is that I use GoodNotes much, much more. In fact, after using every PDF-based handwriting app that I could find, I’ve come to believe that GoodNotes is an essential, best in its class app that every student and teacher should own. First, my teaching style revolves around handouts with lots of blank space that I print out and distribute to students. I then annotate a PDF version of the handout on my iPad. This strikes a nice balance between the structure of slides and the freedom of whiteboards, and encourages student participation without forcing them to constantly scribble down notes. While I think GoodNotes is useful for a number of different situations, this is the primary use that I’ll discuss in this post. I use the former when reading and annotating articles, since highlighting the actual text allows me to tabulate and share all the text that I highlight (more on this later), and the latter when teaching, since I’m more interested in writing and drawing than selecting text. 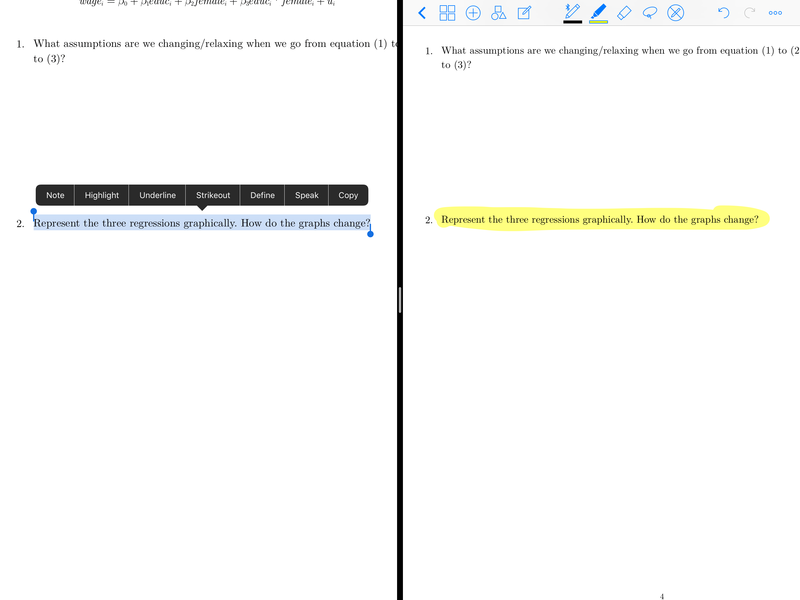 GoodNotes excels at drawing on PDFs, but doesn’t do highlighting of text and commenting the way Adobe Reader does. For that, I highly recommend PDF Expert. With all of that said, let’s get into what makes GoodNotes so great. Which color is he going to use? What do all those icons represent? He’s using an Apple Pencil?? I can’t count the number of times the lock function has been crucial. 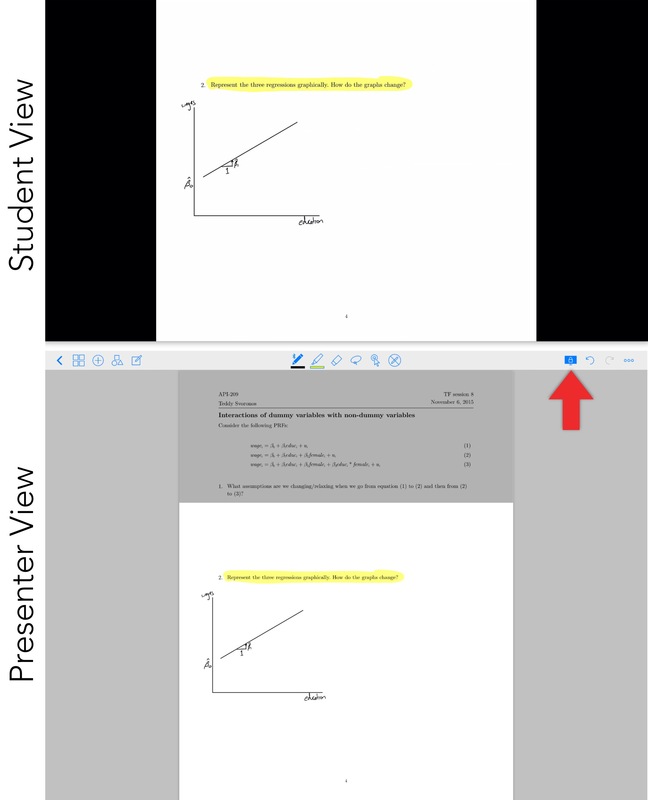 It allows me to zoom in to precisely draw a portion of a graph (either by pinching to zoom or using the zoom window) while the students see the whole graph, and it allows me to zoom out and get a sense of where we are in the document while keeping students focused on a particular problem. A well implemented presenter view is sorely lacking in other apps that I’ve tried, and is the biggest reason why I keep coming back to GoodNotes. GoodNotes has a handwriting engine powered by MyScript which, in my experience, is incredibly accurate. Evernote and OneNote do server-side handwriting recognition, which means you need an internet connection and there will be a delay in recognition – something that’s been particularly noticeable with Evernote in my experience. All of GoodNotes’ recognition is local to your machine and almost instantaneous. You can select a portion of your handwriting and tap “Convert” in the context menu to get just that text, which can then be shared, as shown in the image above. This is the big one: when exporting a PDF from GoodNotes, your recognized handwriting gets embedded in the shared PDF. This makes your written text not only searchable, but selectable in apps like PDF Expert. Plus, your searchable notes can be quickly shared to any service you’d like – including Evernote and OneNote. I personally feel that the GoodNotes developer should play up these features more, particularly #3. 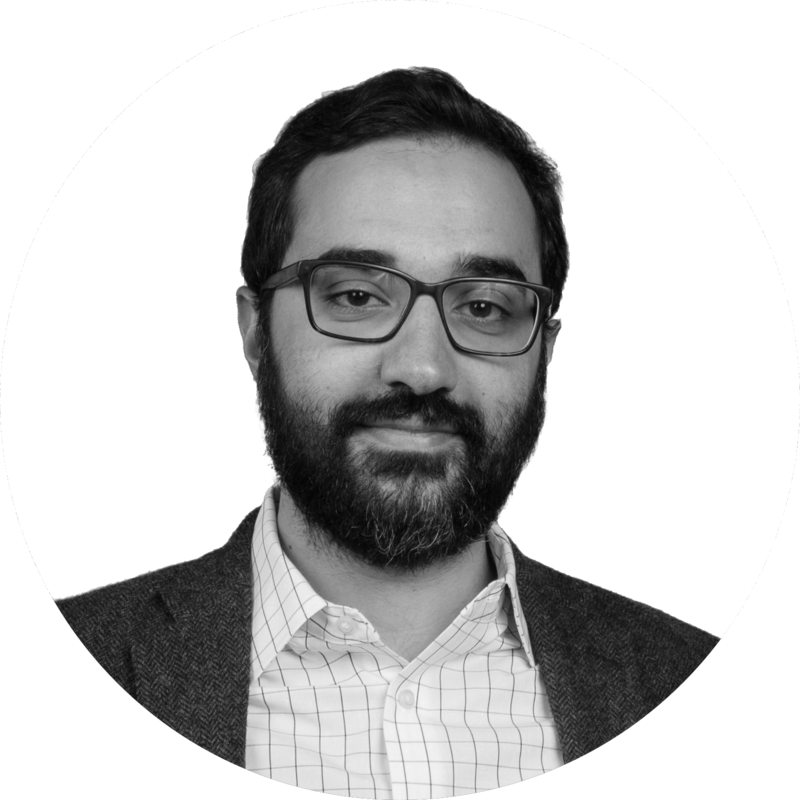 As services increasingly use proprietary formats to include cool features, GoodNotes is towing the line of openness and exportability. 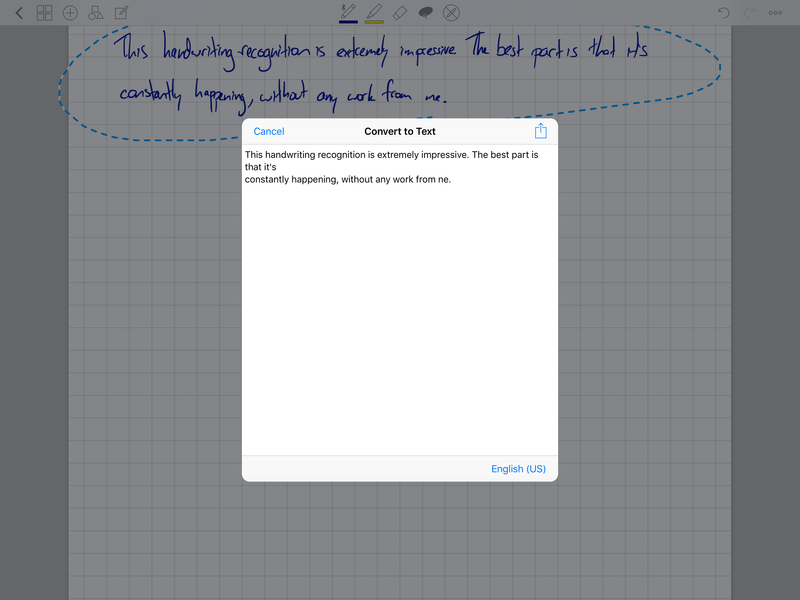 To me, presenter view and handwriting recognition are the big wins for GoodNotes. But the more I use the app, the more I notice delightful details that make for an exceptional experience. Here are just a few. The eraser can be configured to automatically deselect after being used once. This is a huge time saver, especially when I also set it to erase entire strokes – quickly get rid of mistakes and move on. The shape recognition button turns your strokes into straight lines and shapes; great for creating graph axes and lines on the go. Once you insert an image, you can tap and hold it to crop, rotate, or move it. When students are working on problems together, I’ll often snap a photo of a particularly well done solution, crop it, and insert it onto the PDF. When typing text, the words show up on an external screen in real time, as opposed to when you’ve deselected the text box. When doing stuff on my iPad, it’s important that the students see some visual indication of what’s going on, and this is a big help. These features add up fast, especially in a teaching environment where small delays and niggles can throw you off and get in the way of learning. 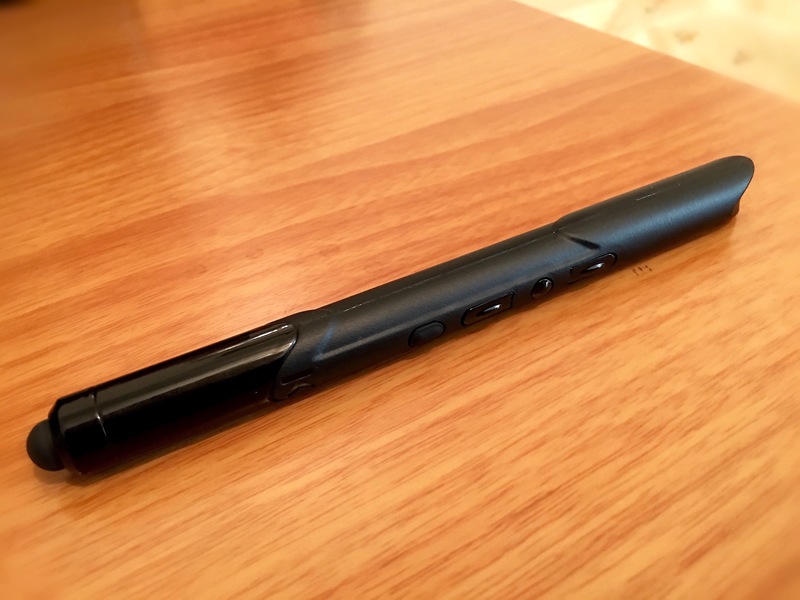 GoodNotes supports every Bluetooth stylus that I’ve ever encountered – and I’ve encountered a lot. The developer also keeps up on all the updated SDKs as these companies develop them, which is more than I can say for most handwriting apps. I’ve tried all of them, and always went back to a passive stylus, until now. The Apple Pencil on the iPad Pro is a revelation for the kind of work that I do. The level of precision coupled with flawless palm rejection is truly amazing. GoodNotes’ support for the Pencil is perfect, and only furthers my love for the app. In short, GoodNotes has defined my experience as a graduate student and teacher attempting to leverage technology. I’ve been grateful to have it for my entire career as a graduate student, but its progress over the years has been remarkable, and I wish I had it in its current form back when I was starting. Just go get it, ok? Keynote on iOS got an update yesterday, with a zillion improvements, the biggest of which are multitasking and Bluetooth keyboard support. These are features that are being added to lots of iOS 9 apps, but on Keynote they enable three fantastic use cases during presentations. What isn’t as obvious is that keyboard shortcuts work while presenting as well. As far as I can tell, they almost perfectly correspond to the OS X version of Keynote. It occurred to me that most bluetooth clickers just map their buttons onto keyboard keys, so I picked up this bluetooth clicker from Staples to test it out despite the fact that it said Windows/Android only on the box. And, lo! I could advance and backtrack slides, and even mute the screen (the equivalent of pressing the “b” key). In the past this has required some wacky workarounds using Accessibility features that broke between versions. This feels much better. When using Split View, only the “main” app can use features like the microphone, camera, and, most relevant to this post, video out. This means that if you’re using Keynote as your main app while Airplaying or using a dongle to project your iPad onto an external screen, only the Keynote presentation will be visible to your audience. This means you’re free to keep OmniOutliner (pictured), Notes, or any other Split View-enabled app on the side of your screen while presenting. As someone who prefers to have my full outline available to me rather than slide-specific Presenter Notes, this is huge. This may not be relevant to a lot of people, but I’m lucky enough to teach in an environment where I have a main, centered projector and an LCD screen on either side of it. 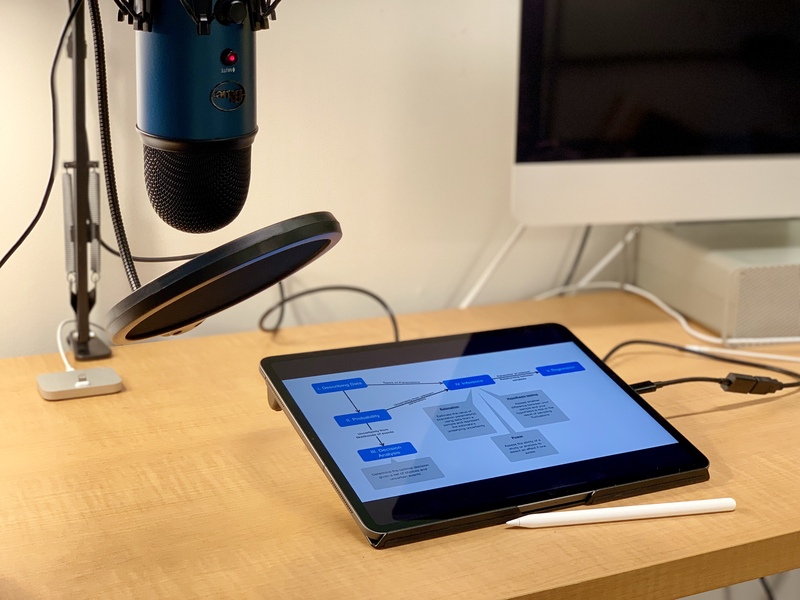 I generally use an Apple TV to project a version of the class handout from my iPad running GoodNotes onto the main screen, and Keynote slides from my iPhone on the side screens (either conceptual slides to provide context or formulas for students to reference). Traditionally, this has meant controlling both my iPad and iPhone simultaneously, which can get a bit hairy. With Split View, this is no longer an issue. 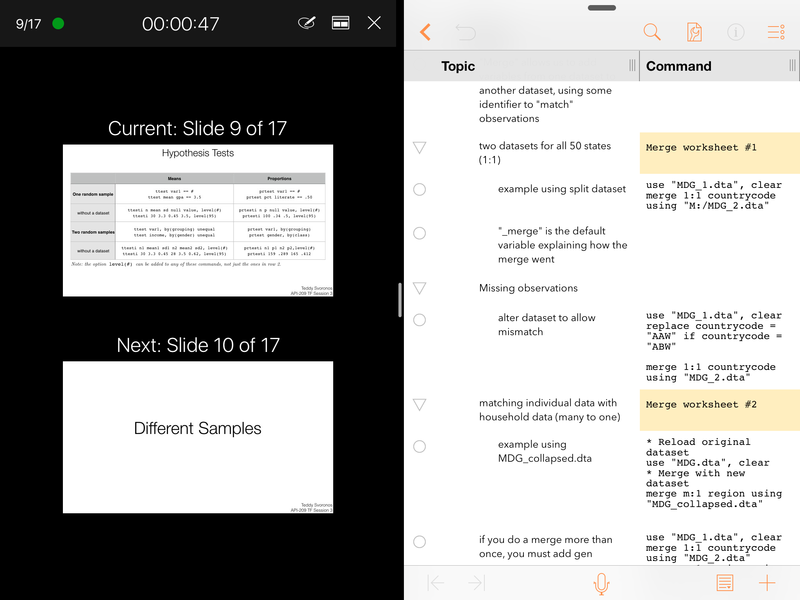 Since GoodNotes has a video out mode, keeping it as the main app on my screen projects only the handout via Airplay. I can then use Keynote’s remote function as the side app to control my iPhone on the side screens. It sounds a bit complicated, but having it all on one screen makes this feel surprisingly smooth. Over the years, I’ve increasingly preferred my iPad for presentations over my Mac. With these new features, my iPad is now capable of creating presentation environments that my Mac simply cannot. Can’t wait to see what’s next.